Since the formation of UDT in WW2, and US Navy Seals during the Cuban Crisis, frogmen's thoughts have turned to effective underwater guns, something above water guns are not very good at. The best a Frogman had at his disposal was a spear gun and a knife, the spear gun could reach out 20 feet, and the knife, not so far. Some effective underwater guns were finally developed, and this led Russian engineers to counter US weapons, and they came up with some interesting guns. The Russians came up with their first underwater weapon in the late 60's and was very effective for it's size. 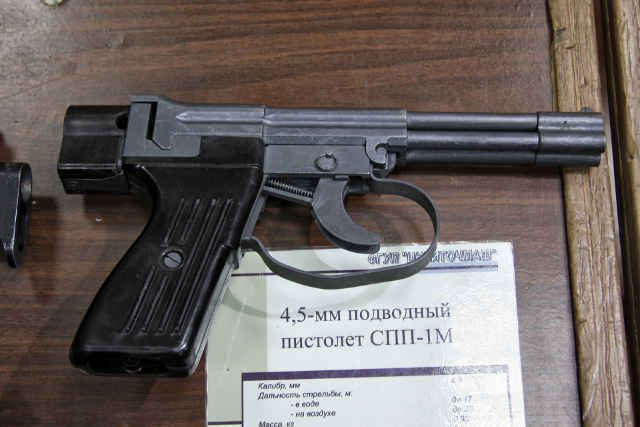 The SPP-1 underwater pistol had 4 unrifled barrels and it's cartridge's payload was a long steel dart. Bullets do terrible underwater, and darts were stabilized hydrodynamically. The cartridge itself was 4.5mm X 145mm, and as a comparison, the standard Russian rifle cartridge is 5.45 X 39mm. It's effective range was 50ft at 16ft underwater, much better than a spear gun. However the deeper you go the worse it gets, which seems to be a problem for all underwater guns. 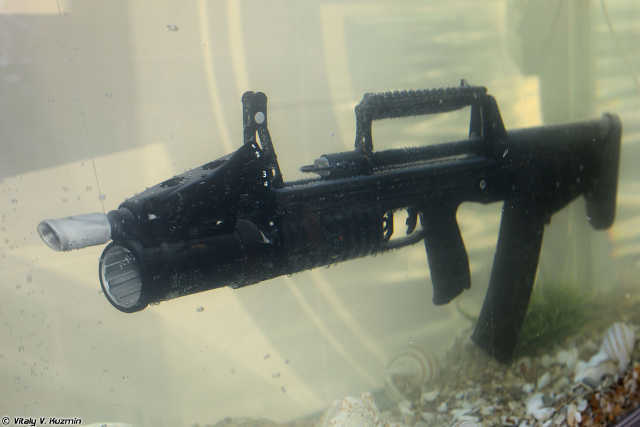 The need for longer range resulted in the APS underwater assault rifle. It also had an unrifled barrel with similar ammunition, a long steel dart. The size of the cartridge was 5.6 X 120mm, which resulted in a huge magazine that did somewhat hinder it's use underwater. The magazine held 26 rounds, could be fired at full auto and the range increased to 100ft at 15ft depth. A rocket powered cartridge was tried, but wasn't as accurate as the standard cartridge. The APS's limitations were soon evident. It could be fired around 2000 times underwater before being worn out, but if it had to be fired on land, it's designed life was only 200 rounds, and incredibly less accurate. The Spetnatz took to carrying an APS with an AK-74, not the best of outcomes. The ASM-DT takes a stab at solving the above water combat capability by building a hybrid design. The receiver can accept two different magazines with a sliding magazine catch. With it all the way back and a APS magazine installed, the rifle can fire 26 APS cartridges in underwater mode. If the frogman has to fight on land, the APS magazine is removed, the sliding catch run all the way forward, and the AK-74 magazine installed. The barrel is a compromise as well. It has shallow rifling in order to spin stabilize above water bullets, and also has special grooves in the base of the rifling in order to vent water if the barrel is full. The rifle also sports a flash hider, and can be equipped with a grenade launcher although there are no underwater grenades. The performance is less but close to an APS underwater and an AK-74 on land. The gun was adopted in 2000, but complaints about the long receiver (due to the long underwater ammunition) and a complicated magazine arrangement led to more research. Adopted in 2013 the newest version of an underwater amphibious gun, the ADS, entered Russian service. Using the same box magazine for the underwater as well as the above water projectiles, the receiver is short, and the overall length is made shorter by being a bullpup design. The new underwater ammunition has the steel dart fully inserted in the cartridge case all the way to the base, shortening the overall length. The effective range is a bit shorter at 75ft at 15ft depth. All the modern accessories are available for this weapon, including silencers, rail mounted devices and grenade launchers. Most of these weapons are still used by Russian military and other countries that use Russian hardware. China has their own version of the APS, the QBS-06, which they say (the Chinese) is much better than the Russian version. In any case, underwater warriors are much better armed than ever.